The traverse from Appleton Pass to Cat Basin provides about 5 miles of off-trail travel, an easy one-day trip. 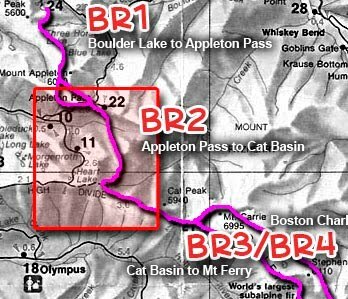 It can be done from the road by strong hikers in a long day, returning to either the Boulder Creek trailhead via the Boulder Lake to Appleton Pass traverse (BR1) or to the Sol Doc River via the Sol Doc trail. The total journey involves about 20 miles of trail travel in addition to the traverse. On the north end this traverse can be linked with BR1 (Boulder Lake to Appleton Pass). On this south end this traverse can be linked with either BR3 (Cat Basin to Mount Ferry) or BR4 (Boston Charlie's to Mount Ferry via Mount Carrie). See the published Climbers Guide for detailed approach information. From Appleton Pass, go E and S in scenic alpland along the ridge separating the Sol Doc River from Boulder and Schoeffel cCeeks. In about 1 mile, on the E side of a large, open meadow on the Sol Duc side of the ridge, pick up a well-beaten trail through the trees. Traverse on the trail past meager but good running water and up through a notch in the ridge that intersects the ridge bounding Cat Creek on the W.
Continue SW from the notch on the trail through cirques and trees on the Cat Creek side of the ridge. The trail ends above 5000 ft. in an open basin on the Cat Creek side of the ridge, located S of Haigs Lake on the Custom Correct map. Descend WSW into the basin, traverse through it, then ascend a total of 0.4 mile WSW to Swimming Bear Lake (not on the map). Pick up the trail again just S of the lake and follow it 0.5 mile S to the High Divide Trail.